this monitor analyzes a full range of body measurements, including weight, body fat percentage, body water percentage, metabolic age, physique rating, visceral fat, muscle mass, and bone mass. It’s a mouthful of measurements, but what it means is that with the Tanita BC533, you now have the unprecedented ability to monitor your body and the effects of your diet and fitness routines, comfortably and affordably in the convenience of your own home. With the Tanita BC533 up to four unique users can benefit. Simply supply your gender, age, height and weight into the memory, step on the scale, and the monitor does the rest. The results are analyzed according to each user’s information, and the result — displayed in the monitor’s 2.25-inch LCD screen — is the one of the most comprehensive at-home readings you can get. This monitor, which is about the same size as a typical bathroom scale, is ideal for anyone who is serious about monitoring their health and fitness. Knowing your body fat percentage — the amount of body fat as a proportion of your body weight — is essential if you want to create a diet and exercise plan that helps reduce the risk of certain conditions such as high blood pressure, heart disease, diabetes and cancer. Body water percentage is the total amount of fluid in your body expressed as a percentage of your total weight. Maintaining a healthy body water percentage ensures that your body functions efficiently. The metabolic age level is related to your body’s metabolic rate and helps you maintain the daily minimum level of energy or calories your body requires when resting or sleeping to function effectively. Even though your total body weight might not change drastically over time, your muscle mass and body fat levels may be changing. Keeping tabs on them can help you stay at a lower risk of certain diseases. And knowing your levels of visceral fat — the fat in the abdominal cavity and surrounding the vital organs — can help you keep heart disease and high blood pressure at bay, and may delay the onset of type two diabetes. In short, this monitor gives you essential information and greater control as you work to stay healthy and live a more active, vital life. Operating on four AA batteries (included), the Tanita BC533 is intended for use by persons up to 330 pounds and is backed by Tanita’s 10-year warranty. The UA-787EJ Quick Response monitor blends digital blood pressure technology and advanced features with simple functionality. This monitor offers memory, time and date feature and more with the simple push of a button. The EA-787EJ stores the last 60 readings in memory and also displays average readings. In addition, the Quick Response offers a time and date function, which indicates when a measurement was taken. Users can also program three alarms per day to remind them when to take a reading. Included with this monitor is the Easy-Fit¿ Cuff, an innovative cuff that instantly fits your arm. It has been specifically designed to fit most arms (9-17″) and provides the highest level of comfort and accurate readings. The UA-787EJ also offers two innovative features, the Pressure Rating Indicator¿ and Irregular Heartbeat feature. The Pressure Rating Indicator provides a snapshot of your blood pressure classification based on your measurements and eliminates the guesswork on what your blood pressure measurements mean. Also included is an irregular Heartbeat Feature that alerts the user and provides an accurate measurement even when an Irregular Heartbeat occurs. It has been clinically validated for accuracy (+/- 3mmHg and Pulse +/- 5%), so you can be confident that your readings are consistently correct. The measurement range is 20 mmHg to 280 mmHg and Pulse: 40 to 200 pulses/minute. Also included are an AC adapter, carrying pouch, trilingual instruction manual, quick start card, four week blood pressure logbook and warranty card. Both the monitor and the cuff contain a Lifetime warranty and is supported by a consumer friendly Customer Service Dept. which can be contacted at 1-888-726-9966. Clinically validated for accuracy, the LifeSource Quick Response Auto Inflate Blood Pressure Monitor allows you to quickly measure your pulse and blood pressure. With programmable alarms that remind you to take your readings, a time/date stamp that helps you track your results, and a Pressure Reading Indicator that simplifies the numbers, this monitor is easy to use. Its Easy-Fit cuff is designed to wrap around most arm sizes while still providing a precise measurement. The monitor stores the last 280 measurements, allowing you to track your blood pressure and pulse over several months. Its time and date stamp makes it easy to look back to previous readings. A built-in, programmable alarm system can be set for up to three times per day to keep you on track for future readings. This cuff has been designed to fit the majority of arm sizes, ranging 9 to 17 inches around. Created for comfort, the band snugly surrounds the arm to ensure an accurate reading. This monitor’s blood pressure measurements are comparable to readings taken using the cuff/stethoscope auscultation method, within the limits of the American National Standards Institute (ANSI), which assures the safety and health of consumers. The monitor features a Pressure Rating Indicator that eliminates guesswork by indicating whether your blood pressure is high, low, or normal. While a trained professional should always interpret your blood pressure measurements, the Quick Response monitor provides an easy way for you to see your pulse and blood pressure levels and understand how the numbers compare. When you are at home, you can plug your Quick Response monitor into the wall to conserve battery life. Conveniently, you can also measure your blood pressure when you’re on-the-go, thanks to its battery power option. The monitor runs on four AA batteries (not included). LifeSource Quick Response Auto Inflate Blood Pressure Monitor with Easy-Fit cuff, Pressure Reading Indicator, AC adapter, quick start card, four-week blood pressure logbook, and trilingual instruction manual (Spanish, French, and English). The UB-328 Wrist Auto-Inflation is an innovative monitor that incorporates digital blood pressure technology and advanced features in a small, compact design. A&D Medical has applied its state-of-the-art measurement technology to monitoring blood pressure at the wrist. This monitor is activated with the push of a single button. The large display simultaneously shows systolic, diastolic and pulse readings. The measurement range is 20 mmHg to 280 mmHg and Pulse: 40 to 200 pulses/minute. The UB-328 stores the last 30 readings in memory and displays average readings. The average reading feature automatically calculates the “average” of the total readings stored in memory. Also included is an Irregular Heartbeat Feature that alerts the user and provides an accurate measurement even when an irregular heartbeat occurs. The UB-328 includes a wrist cuff size which has a range of 5.3″ to 7.7″. Also included are a rigid carrying case, trilingual instruction manual, quick start card, four week blood pressure logbook and warranty card. Both the monitor and the cuff contain a Lifetime warranty and is supported by a consumer friendly Customer Service Dept. which can be contacted at 1-888-726-9966.Home blood pressure monitoring, combined with exercise and a healthy diet, can help maintain a healthy heart. The LifeSource UB-328 Wrist Blood Pressure Monitor is one of the most technologically advanced yet portable blood pressure monitors available in the marketplace today. 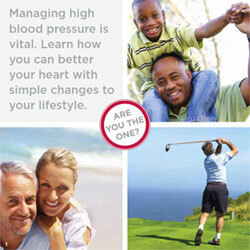 The LifeSource UB-328 delivers accurate, clinically-proven blood pressure readings in the comfort of your own home. View larger. The LifeSource UB-328 features a wrist auto-inflation that’s activated with the push of a single button. The large display simultaneously shows systolic, diastolic and pulse readings. The automatic memory keeps your last seven blood pressure measurements close at hand, letting you keep track of patterns and progress. The UB-328 stores the last 30 readings in memory and automatically calculates and displays the average of the total readings saved. Also included is an irregular heartbeat feature that alerts the user and provides an accurate measurement even when an irregular heartbeat occurs. 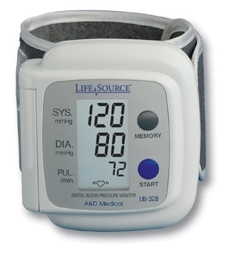 The LifeSource UB-328 blood pressure monitor can assist in the management of hypertension, improve patient compliance to treatment of high blood pressure, and be used as a tool in a preventative health management program. The UB-328 includes a wrist cuff size which has a range of 5.3 inches to 7.7 inches. It also includes a rigid carrying case to protect the monitor when not in use, lifetime warranty card, four-week blood pressure logbook, quick-start card, and large-print trilingual instruction manual. The LifeSource line of digital blood pressure monitors, which include automatic and manual inflate models, enables people with hypertension, high blood pressure, diabetes, or those who have an irregular heartbeat to accurately monitor their blood pressure at home. LifeSource’s clinically validated blood pressure monitors also help assist physicians in the diagnosis and management of hypertension and related diseases, such as obesity, high cholesterol, and kidney disorders. LifeSource UB-328 blood pressure monitor, wrist cuff, carrying case, lifetime warranty card, four-week logbook, quick-start card, and instruction manual. Bayer’s A1CNow SELFCHECK provides you a simple way to know how well you are doing with your diabetes, so you can be in better control. When it comes to controlling your diabetes, knowledge is power. And, knowing your A1C number (2-3 month indication of average blood glucose) is critical. Why? Because even small changes in your A1C can mean big changes in your risk for serious complications. Do you know your Quality of Life Number? The result tells you if you medications are working or if your are eating properly or exercising enough. Acurate & Reliable Readings with HyperSense Technology (FDA Approved)Simple and Easy to Operation with Large DisplayPC USB Link to log Blood Pressure readings on PC and plot them on ComputerAll New Improved Medron Health Plus softwareStores upto 80 Readings with 2 User Profiles. Pace of Play Monitor Tired of 5-6 hour rounds? The Pace Monitor will help keep you on schedule. The Pace Monitor counts the elapsed time which players can compare to the enclosed Pace Card to let them know if they’re on schedule for a 4 hour round or a little bit behind. It’s a great tool to help golfers actually measure how quickly they’re playing. If you have any questions about this product or would like to order by phone, please call us Toll Free at 888-733-8383. We look forward to hearing from you! The advocate blood pressure monitor offers precise blood pressure readings on an easy to read display. it features a large memory capacity (up to 120) and comes with four aa batteries. This spoon measures the level of salinity of your food (liquid, sauce). Great tool if you have high blood pressure. Easily check salinity of food in liquid form. Get the most from your workouts with an Omron HR-100 Heart Rate Monitor. By giving you continual, accurate results, the HR-100 keeps you in the ideal heart rate zone for more effective, fat-burning workouts. Whether you are a regular walker or jogger, managing your heart rate during your workouts is a crucial component of achieving your goals. 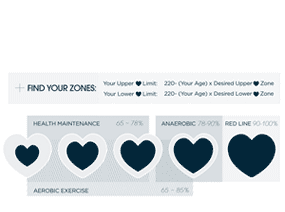 Every fitness program from weight maintenance to strength training has an optimal Heart Rate Training Zone. With an Omron Heart Rate Monitor, you can track your heart rate to ensure you stay in your optimal zone by adjusting the intensity of your workout and maximizing your success. HR-100 Heart Rate Monitor, lithium batteries, storage case, transmitter chest strap and instruction manual. + Health Maintenance–(65%-78%) Low-intensity level training. Good if you’re a beginner and strengthening your cardiovascular system. + Aerobic Exercise–(65%-85%) Increases strength and endurance. Burns calories faster and can be sustained during longer workouts. + Anaerobic Exercise–(78%-90%) Improves speed and power. This zone builds muscle faster, but cannot be maintained for long workouts. + Red Line–(90%-100%) Maximum capacity. The advocate blood pressure monitor (model kd-575l) offers precise blood pressure readings on an easy to read display. it features a large memory capacity (up to 120) and comes with four “aa” batteries. Omron”s Advanced Positioning Sensor automatically confirms the monitor is at heart level, ensuring an accurate reading. This monitor is easy to use and not only provides systolic/diastolic and pulse readings, but also advanced diagnostics such as an irregular heartbeat detector and an average of the last three blood pressure readings. With simple, silent and one-touch operation, an accurate and reliable blood pressure measurement is seconds away. Cuff fits wrist sized 5 1/4″ to 8 1/2″ in circumference.Wrist blood pressure monitors are portable, accurate and simple to use. They provide a convenient choice for those who want a second unit for away from home or who have trouble placing a cuff on their arm. 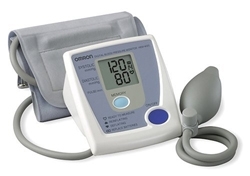 The Omron HEM-650 Wrist Blood Pressure Monitor with APS (Advanced Positioning Sensor) uses Omron’s patented IntelliSense technology, which inflates the wrist cuff to the ideal level with each use and offers fast, personalized, and automatic inflation for maximum comfort. No adjustments are required to select an inflation level–especially convenient for hypertensive users and for people with certain arrhythmia or heart disorders, because their blood pressure is more likely to fluctuate. And with the HEM-650’s 90-memory recall with date and time stamp, as well as averaging capabilities for the last three readings, you can track your blood pressure and pulse progress as your work towards a healthier lifestyle. The HEM-650 also features a system that detects an irregular heartbeat, giving you an even better understanding of your heart’s health. Plus, you’ll have additional peace of mind knowing that the HEM-650 comes with a 5-year warranty. Because the HEM-650 has a wrist cuff, it is particularly helpful if you have a larger than average sized arm. The monitor fits those with a wrist size of 5.25 to 8.5 inches, and it ensures easier and more comfortable use. Note, however, that a wrist monitor does require proper positioning of the device at the heart level. Correct cuff positioning is critical when monitoring blood pressure, fortunately, the HEM-650 features an advanced positioning sensor that automatically confirms that the cuff is level with the user’s heart, thereby ensuring an accurate reading. HEM-650, 2 “AAA” batteries, carrying case, and user manual. What is the Advanced Position Sensor (APS)? APS ensures an accurate reading. 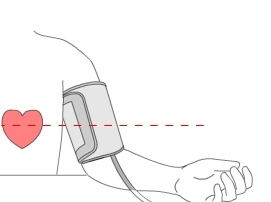 Correct cuff positioning is critical when monitoring blood pressure. Only Omron Wrist Blood Pressure Monitors with APS have a unique positioning sensor that automatically confirms the cuff is level with the user’s heart. This helps ensure that each and every reading is accurate. Simple controls and a large, easy-to-read display make fat and weight monitoring a snap. View larger. Just step on and see your data in seconds. weight loss or weight maintenance program. The HBF-400 supports up to four personal profiles, so each member of your family can track their own measurements independently. Plus, an easy-to-read and large digital display makes it a snap to get the information you need. The weight display measures weight up to 330 pounds in .2-pound increments, while body fat percentage can be measured from 5 to 60 percent in .1 percent increments. One of the keys to weight loss and management is tracking your body mass index, or BMI. 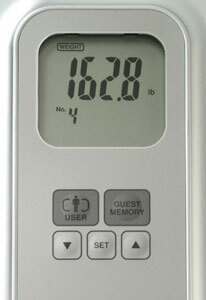 The HBF-400 rates your BMI from 7.0 to 90.0 in .1 increments. 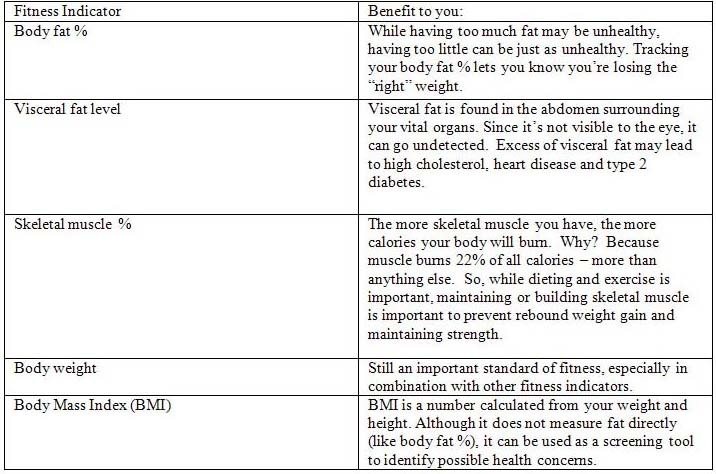 BMI is classified at three levels: underweight, normal, overweight, and obese. The HBF-400 is set up to provide measurements for folks of nearly all heights (3’4″ to 6′ 6-3/4″) and nearly all ages (10 to 79 years). Measurements are customized for males and females, as well. The HBF-400 runs on four AA batteries, and you can expect about a year of battery life when the device is used four times a day. The unit measures 12.2 x 11.8 x 2.1 inches (L x W x H). The unit weighs 4.7 pounds. HBF-400 unit, 4 AA batteries, and instruction manual. Wrist monitor is a hypertension level indicator.The Omron 3 SERIES wrist blood pressure monitor is a quick and easy solution to checking your blood pressure at home or on the go. This lightweight, portable model lets you monitor anywhere, and features Advanced Averaging technology that displays the average of the last three readings taken within 10 minutes. The attached cuff fits wrist sizes 5-1/4 inches to 8-1/2 inches. Your blood pressure numbers often change. For instance, your blood pressure in the morning can be significantly different than at night, when you visit a doctor’s office, or after exercising. By using an Omron blood pressure monitor at home, you’re able to detect changes in your blood pressure any time you want. One Omron BP-629 3 SERIES wrist blood pressure monitor, storage case, two AAA batteries, and English/Spanish instruction manual. A great read for diabetics considering the purchase of an insulin pump or continuous glucose monitoring system. This e-book gives a detailed inside look at the daily life of a Type 1 diabetic who uses an insulin pump and glucose monitor. Taking your blood pressure is easy with the lightweight and convenient HEM-432 blood pressure monitor. Simply wrap the cuff around your arm and squeeze the bulb to begin inflation. 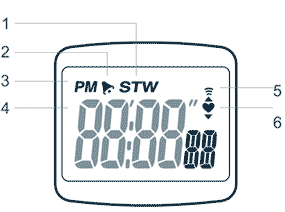 In seconds, your blood pressure and pulse readings are displayed on the large digital panel. The HEM-432 has been tested, evaluated and proven to meet the rigorous safety and accuracy standards set by independent organizations. Manual blood pressure monitors require the individual to manually inflates the monitor, which is accomplished by squeezing the bulb to the necessary inflation level. Taking your blood pressure is easy with the lightweight and convenient Omron HEM-432C Manual Inflation Blood Pressure Monitor . This monitor comes equipped with a standard adult-sized cuff that fits arms nine-to-13 inches in circumference. Simply wrap the cuff around your arm and squeeze the bulb to begin inflation. In a few seconds your blood pressure and pulse readings are displayed on the large digital panel. Omron’s monitors are clinically proven for accuracy so you can use the HEM-432C to track your blood pressure and pulse progress as your work towards a healthier lifestyle. 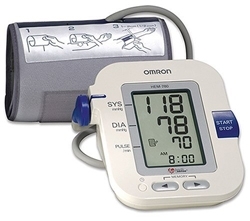 The Omron HEM-432C delivers accurate, clinically-proven blood pressure readings in the comfort of your own home. To take an accurate reading, first position the marker so it is centered on the inside of your arm and aligned with your middle finger. There are several easy steps to taking your blood pressure with this monitor. First of all, avoid eating, smoking, and exercising for at least 30 minutes before taking a measurement. Remove tight-fitting clothing from your upper arm, and sit in a chair with your feet flat on the floor. Slide your left arm through the cuff and position the cuff approximately 0.5-inches above the elbow. On the cuff you’ll notice a blue marker; position this marker so it is centered on the inside of your arm and aligned with your middle finger. Next, secure the cuff with the closure strip. The cuff should make direct contact with your skin, but you should be able to easily fit your index finger between the cuff and your arm. Place your arm on a table so that the cuff is positioned at the same level as your heart. Rest comfortably in a relaxed environment for at least 15 minutes prior to taking your blood pressure measurement. Once you feel relaxed, begin inflating the cuff by rapidly squeezing the inflation bulb until you have reached approximately 30-40 mmHg higher than your normal systolic reading. If your normal systolic blood pressure reading is unknown, inflate the cuff to 180 mmHg (never inflate higher than 299 mmHg). When the desired pressure has been achieved, release the inflation bulb. Once inflation stops, the measurement is started. As the cuff deflates, decreasing numbers will appear on the display. When the measurement is complete the Heartbeat symbol stops flashing and your blood pressure and pulse rates are displayed on the screen. And remember, always consult your physician for specific information about your blood pressure. Additionally, many factors can affect your blood pressure, including physical exertion, emotional fluctuations, medications, and stress. So having your blood pressure monitored at a pharmacy with an in-store device after you’ve been shopping or walking around might not provide you with the most accurate measurement. Monitoring your blood pressure at home allows you achieve a relaxed state more easily, and it gives you the flexibility to take your measurements at various times during the day. By keeping track of your home blood pressure readings, you can provide your healthcare professional with a log of your measurements over time. This can help them evaluate the effectiveness or need for medication. Omron HEM-432C blood pressure monitor, inflation bulb, standard arm cuff, and instruction manual. Taking your blood pressure is easy with this fully automatic monitor. Simply wrap the cuff around your arm and press START. In seconds, your blood pressure and pulse readings are shown on the digital display.Not only does the HEM-712CLC Automatic Blood Pressure Monitor utilize Omron’s patented IntelliSense technology, but it also features an larger cuff that is perfect for larger-sized arms. It’s easy to apply the cuff to your arm without any assistance — simply wrap the cuff around your arm and press start. In seconds your blood pressure and pulse are displayed on the large digital panel. Proven time and time again, Omron’s IntelliSense technology ensures accurate, clinically-proven, and comfortable readings. 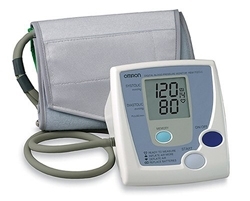 The Omron HEM-712CLC delivers accurate, clinically-proven blood pressure readings in the comfort of your own home. View larger. There are several easy steps to taking your blood pressure with this monitor. First of all, avoid eating, smoking, and exercising for at least 30 minutes before taking a measurement. Remove tight-fitting clothing from your upper arm, and sit in a chair with your feet flat on the floor. Slide your left arm through the cuff and position the cuff approximately 0.5-inches above the elbow. On the cuff you’ll notice a green marker; position this marker directly over the artery on the inside of your arm. Next, secure the cuff with the Velcro material. The cuff should make direct contact with your skin, but you should be able to easily fit your index finger between the cuff and your arm. The IntelliSense monitor inflates the cuff to the ideal level with each use — you never have to make any adjustments to select an inflation level. This is especially convenient for hypertensive users and for people with certain arrhythmia or heart disorders because their blood pressure is so likely to fluctuate. The biggest advantage of using the IntelliSense technology is a personalized inflation, every time, for maximum comfort. Omron HEM-712CLC blood pressure monitor, large cuff, and instruction manual. DUO-CARE is the first combined blood glucose and blood pressure monitor intended for home use. The monitor is compact and lightweight device, designed for ease of use, comfort, and accurate measurements. For the diabetic patient, or anyone concerned with everyday health monitoring, DUO-CARE offers advanced technologies, exceptional analytic performance, and unparalleled convenience. The glucose test is reported in 5 seconds with only 0.5 microliters of blood; blood pressure results are generated in about 30 seconds using advanced oscillometric wrist-cuff technology. The DUO-CARE package contains all items needed to operate the monitor and familiarize the user with its proper function (monitor, 2 AAA batteries, check strip, glucose test strips (vial of 10), lancet device, lancets (package of 10), instruction manual, quick reference guide, and measurement log book). An attractive carrying pouch is provided for easy storage of the monitor and accessories. Routine blood glucose testing requires the separate purchase of DUO-CARE glucose test strips (only DUO-CARE glucose test strips may be used with the DUO-CARE monitor). The Full Body Sensor Body Fat and Composition Monitor and Scale is a breakthrough device to measure your body composition at home. It measures 5 fitness indicators including body fat %, BMI, weight and more! 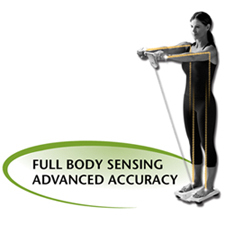 The innovative Full Body Sensor is the only at-home body composition monitor that accurately measures your entire body. It uses 6 advanced sensors; 2 for your hands and 4 for your feet. Clinically proven to be as accurate as expensive medical devices professionals use. Exceed your fitness goals with the Omron Full Body Sensor. Uses 6 advanced sensors: 2 for your hands and 4 for your feet. The monitor looks like a regular scale when not in use. Why should I use a Body Composition Monitor? Maintaining a fit and healthy body is more than just about weight. 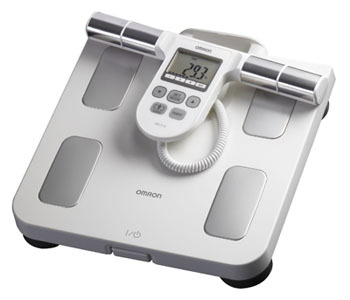 Here are the benefits for tracking your total body composition with an Omron Full Body Sensor. Bioelectrical Impedance (BI) is considered one of the most accurate and accessible methods of screening body fat and other body composition measurements in the privacy of your own home. Within seconds, BI sends an extremely weak signal to measure the inside of your body. Muscle, blood, bone and body tissue have high water content, which means they conduct the BI signal easily. 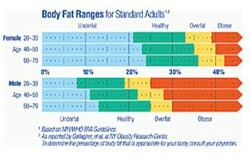 Body fat, however, stores no water, so the BI signal is blocked or impeded from easily traveling throughout the body. The blocked signal (or high impedance) indicates the presence of more body fat. The HBF-510W uses (4) AA batteries that last with normal use for about a year. The main unit measures 13 x 12 x 2.2 inches (L x W x H) and weighs 4.7 pounds. 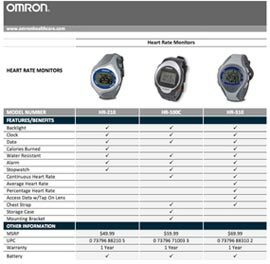 Which Omron Fitness Monitor is Right for You? Blood Glucose Meter Advocate Duo Digital Blood Pressure Monitor is a 2 in 1 system designed to measure blood glucose outside of human body, and to measure blood pressure non-invasively. It is intended for use in the home and in clinical settings. The glucose blood monitor shall not be used for the diagnosis of diabetes and hypertension, or for testing of newborns. Blood glucose is based on the measurement of electrical current generated by the reaction of glucose with the reagent of the strip. The blood glucose meter monitor measures the current and displays the corresponding blood glucose level. The strength of the current produced by the reaction depends on the amount of glucose in the blood sample. The greatest feature of this blood pressure monitor system is its speaking function (with a talking symbol on the monitor), which is an acoustic aid for users especially with visual disability. Please note that this function is optional. If the monitor does not have , it will not provide speaking function. Great kit for any diabetic. A blood glucose plus blood pressure monitor. Blood Glucose Meter Advocate Duo Digital Blood Pressure Monitor is a 2 in 1 system designed to measure blood glucose outside of human body, and to measure blood pressure non-invasively. It is intended for use in the home and in clinical settings. The Blood Glucose Meter Advocate Duo Digital Blood Pressure Monitor sytem contains A blood glucose plus blood pressure monitor, Owners manual, Sporty carrying bag, First time using guide, Warranty Card. 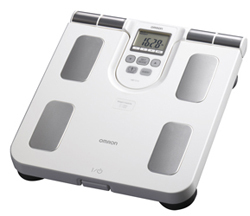 We all know how important it is to lose body fat and the Omron Fat Loss Monitor gives you the ability to track the fat you are losing. The Omron Fat Loss Monitor is a hand held body fat analyzer that is affordable and an easy way to measure body fat in the privacy of your own home. 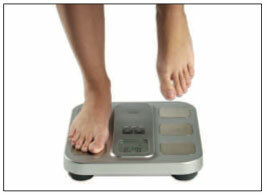 This scale uses the Bioelectrical Impedance (BI) method by sending a safe, low-level electrical current through your body to calculate the amount of body fat tissue. Upper arm monitor is a irregular heartbeat dector.The Omron 5 SERIES upper arm blood pressure monitor is a quick and easy way to check your blood pressure at home. This model offers dual settings for two users and a memory storage space for up to 60 readings, ensuring you get reliable information necessary for managing heart health. 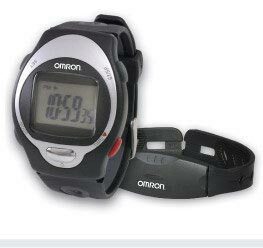 One Omron BP-742 5 SERIES upper arm blood pressure monitor, one contoured D-ring cuff (fits arm sizes 9″-13″ in circumference), four AA batteries, and English/Spanish instruction manual. With the ComFit Cuff that easily wraps around the arm (fits arms 9″ to 17″), this automatic digital blood pressure monitor makes the measurement procedure easier. The optimal measurement technology through personalized inflation for each person enables accurate measurement in a short time.Not only does the HEM-780 Automatic Blood Pressure Monitor utilize Omron’s patented IntelliSense technology, but it also features the innovative Comfit Cuff. The ComFit Cuff is pre-formed for a quick and proper fit that is perfect for both medium and large-sized arms (nine to 17 inches). It’s easy to apply the cuff to your arm without any assistance — simply wrap the cuff around your arm and press start. In seconds your blood pressure and pulse are displayed on the large digital panel. Proven time and time again, Omron’s IntelliSense technology ensures accurate, clinically-proven, and comfortable readings. And with a 90-memory recall with date and time stamp, you can track your blood pressure and pulse progress as your work towards a healthier lifestyle. The Omron HEM-780 delivers accurate, clinically-proven blood pressure readings in the comfort of your own home. The IntelliSense monitor inflates the cuff to the ideal level with each use — you never have to make any adjustments to select an inflation level. This is especially convenient for hypertensive users and for people with certain arrhythmia or heart disorders because their blood pressure is so likely to fluctuate. The biggest advantage of using the IntelliSense technology is a personalized inflation every time for maximum comfort. Omron HEM-780 blood pressure monitor, AC adapter, storage case, ComFit cuff, four AA batteries, and instruction manual.